The heat is on, and it’s easy to daydream about a relaxing getaway in a distant land. We’ve seen an incredible array of eco friendly resorts spring up around the world that bring you closer to nature while providing top-notch luxury accommodation. Whether you’re dreaming of a romantic, isolated beach paradise, a cozy geodesic chalet in the alps, or even a forested mountain lodge fit for a hobbit, read on for 7 eco-luxe resorts sure to get the travel bug biting! 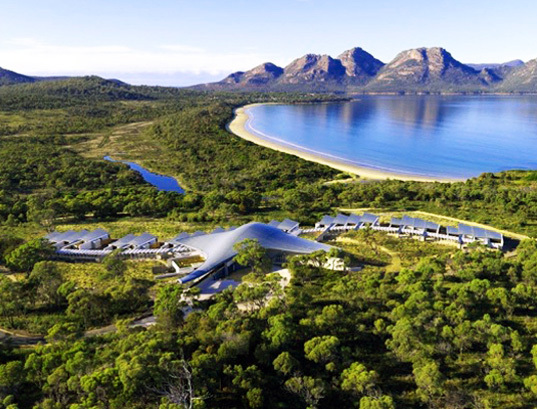 Inspired by the nearby waves and sandy beaches, the serene Saffire Resort in Tasmania has transformed a disused caravan park into a luxurious resort shaped like a manta ray! Circa Architecture took great pains to replenish the site’s ecosystem, restoring the local vegetation and trees for all to enjoy. Rainwater harvesting systems keep the grounds watered, while also protecting them from bushfires. Each guest room overlooks the phenomenal landscape and mountains of Oyster Bay, offering a secluded retreat that connects guests with the environment that the resort itself helped to rebuild and protect. 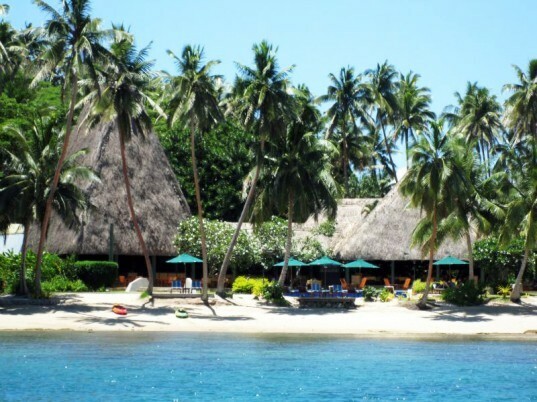 This beautiful resort on the island of Vanua Levu, Fiji, is owned by none other than Jean-Michel Cousteau. Like his famous father Jacques, Cousteau is a passionate environmentalist and ocean explorer, and brings his experiences to his eco resorts around the world. The traditional thatched roof Jean-Michel Cousteau Fiji Islands Resort is just steps from the crystal blue waters outside of Savusavu. Guests can enjoy snorkeling and diving amongst the coral reefs of the marine reserve, dine on organic fare grown on-site, or sit in the shade under the mangroves which are being restored to combat erosion. The energy-efficient resort also recycles everything from kitchen scraps to wastewater, taking care to not disrupt Fiji’s natural ecosystem. The beach fantasy also gives back to the local community through a charity foundation. If you’re looking to truly get away from it all, check into the serene Six Senses Resort on Vietnam’s Con Dao Island. The naturally cooled suites were designed by AW² Architecture, and they earned a benchmark from Green Globe 21. Rising from the sand dunes on an isolated beach, the resort is built from local sustainable materials – including the timber suites and a pedestrian bridge that brings guests from the river all the way to the beach. Six Senses brings guests total relaxation and luxury in a completely tranquil setting – perfect for when you need to totally unplug from the world. If you’ve ever wanted to stay within a grassy hill just like a Hobbit, the incredible Magic Mountain Lodge in northern Patagonia is the stuff that dreams are made of. Guests board a suspended rope bridge to reach the mountain-shaped hotel set in the dense forest of the Hulio Hulio Biological Reserve. Dormer windows peek out of the vegetated stone façade, which filters the water which spouts from a fountain on the roof. Inside, guests can enjoy the bar, restaurant, and sauna while gazing upon the nature reserve, or luxuriate outside in hot tubs made from gigantic hollowed tree stumps. 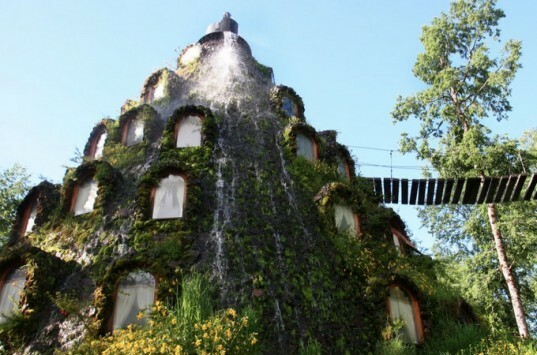 Chile’s Magic Mountain Lodge gives visitors a taste of the wild Patagonia region coupled with enough magical fantasy to impress the biggest Lord of the Rings fan. 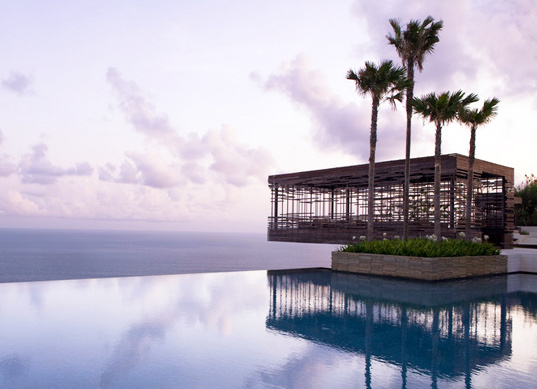 The idyllic island of Bali is a tropical paradise, and the Alila Villas Uluwatu eco resort brings guests luxury as well as the highest level of certification for Environmentally Sustainable Development. The resort, designed by WOHA, marries the beautiful landscape with delicately placed bridges, verandas, and canopies that blend the outdoors with the interiors. Following the slope of the land, the villas bring guests in close contact with the undisturbed natural vegetation, and spectacular views of the Indian Ocean for an incredible island getaway. 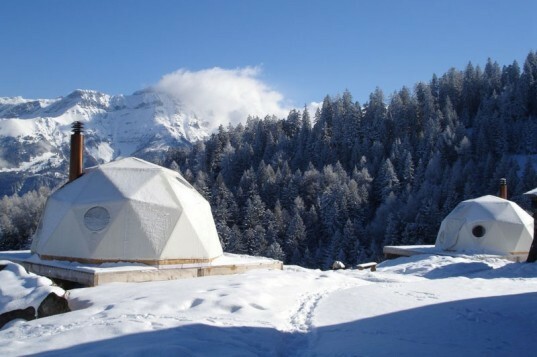 For those who find relaxation at the top of a snowy hill, the Whitepod eco retreat is a luxurious private ski resort in the iconic Swiss Alps. Guests can enjoy winter adventures like skiing, snowboarding, dog sledding and snowshoeing, set against the backdrop of the picturesque Alps. After a day of mountain exploration, guests can warm up by the fireplace inside their own private geodesic dome while enjoying sprawling views of the surrounding snowscape. Guests can dine and socialize in the main chalet before tucking into their toasty beds for the night. Whitepod is powered by renewable energy and is also open in the summer for outdoor adventurers to enjoy after a day of mountain climbing and hiking. 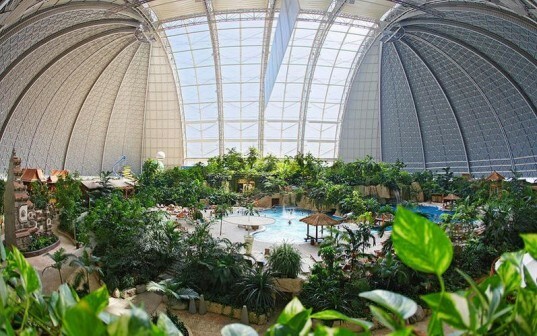 Germany generally experiences long, cold winters – however now locals and visitors alike can relax in faux tropical splendor, at the Tropical Islands resort outside of Berlin. Formerly a gigantic airship hangar, the giant dome is the world’s largest freestanding building. The disused dome was transformed into a warm “oceanside” resort- complete with 50,000 trees, fake villages, and four Olympic-sized pools. The skin of a portion of the dome was replaced with glazed windows, flooding the pools with natural light while maintaining the retreat’s warm 79 degree year-round climate. Tropical Islands is one of the most interesting adaptive reuse projects that we’ve seen so far! Tropical Islands, seriously??? How is this eco friendly? It's a catastrophe, with plenty of rip-offs, unfriendly and untrained personnel, and it's way too expensive for families (an admission-only day pass is €36 per adult and €28.50 per child - everything else costs extra)! I gave it two chances and definitely cannot recommend it. This is almost an exact replica of my dream home. When can I move in? I spent a 3day weekend at Tropical Island for my 40th. It was awsome. We stayed in a canvas tent with wooden platform floor, inside the dome. I stayed in my swimsuit the entire time. LOVED IT!!! I have been to Jean-Michel Cousteau Resort and would very much like to go back. Their coconut ice cream is to die for. How could you choose just one? Vacation Tour please! Oy, this really makes me want to take a trip. 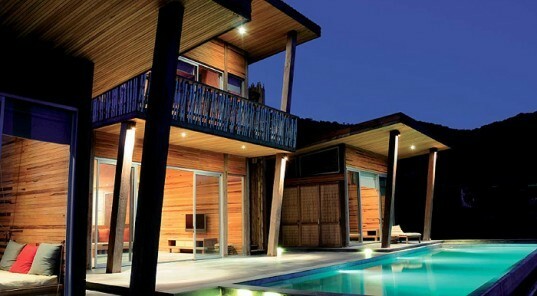 And the Alila Villas Uluwatu eco resort just shot to the top of my destinations list! One way ticket to Bali, please! Great now I'm stuck in a day dream!! My bucket list just grew by 7, and Magic Mountain is at the top! I want to check out the gigantic renovated airship hangar! My favorite is the tropical islands! Where do I sign up??? Dying to go to the Magic Mountain lodge! Oh wow, i absolutely love the Alila Villas Uluwatu. What a dream! The heat is on, and it's easy to daydream about a relaxing getaway in a distant land. 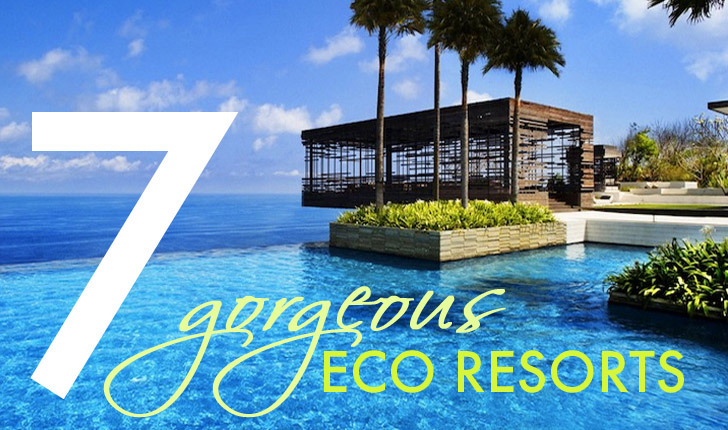 We've seen an incredible array of eco friendly resorts spring up around the world that bring you closer to nature while providing top-notch luxury accommodation. Whether you’re dreaming of a romantic, isolated beach paradise, a cozy geodesic chalet in the alps, or even a forested mountain lodge fit for a hobbit, read on for 7 eco-luxe resorts sure to get the travel bug biting!